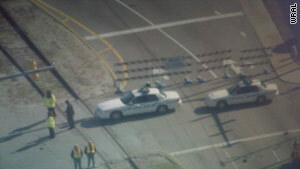 Police block off traffic in Morehead City, North Carolina, in response to a hazmat situation at the city's port on Tuesday. 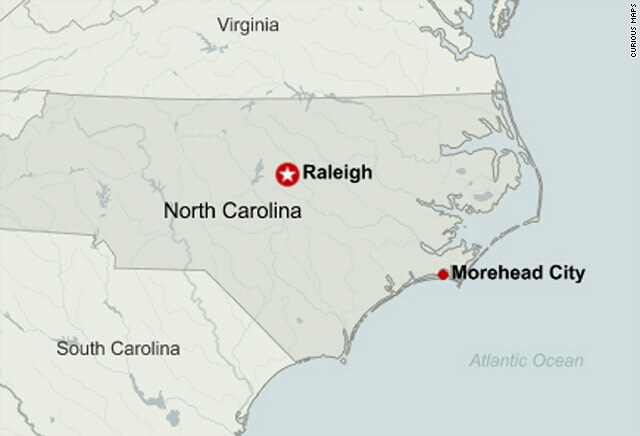 (CNN) -- An early-morning hazardous material spill has been contained, but officials in Morehead City, North Carolina have closed its port and recommended evacuation of its downtown area after nine containers of high-explosive materials were punctured. The incident occurred when a forklift unloading a vessel punctured a large container and the drums inside it that contained the explosive compound PETN, said Morehead City Police spokeswoman Amy Thompson. PETN was allegedly one of the components of the bomb concealed by Umar Farouk AbdulMutallab, accused of trying to set off an explosion aboard Northwest Airlines Flight 253 as it approached Detroit, Michigan, on December 25. PETN is a highly explosive organic compound belonging to the same chemical family as nitroglycerin. Thompson quoted Morehead City Fire Chief Wes Lail as saying the entire cleanup is a five-step process, and only the first step had been completed. There have been no injuries or any environmental damage, according to Carteret County officials. Some residents and business workers left the area, but Tompson said she didn't know how many. "Right now our advice to everybody is if they're uncomfortable staying in downtown Morehead, to evacuate further west. And if they choose to stay home, stay away from windows and doors," Mayor Jerry Jones told CNN. "Don't get out and sightsee and meander around. It is dangerous, and we need to ensure the safety of our public. As the day goes on and we feel like we have more information, we will pass that information on." He said that emergency management officials "feel that everything is contained." But at the early stages in the cleanup, they advised keeping people from getting closed to the port. Carteret County officials said U.S. 70 will be closed from 4th Street in Morehead City to the Morehead-Beaufort high-rise bridge for most of the day. The Coast Guard has barred traffic to and from the zone. The Coast Guard captain of the port ordered the facility closed and a 300-yard safety zone has been established to exclude any vessels operating any closer. Jones said the port called the city before 4:45 a.m. ET to say that a product spilled out of drums on the port property. "We immediately identified it was a hazardous material, assessed that it was contained on the port and not (going) to go into our neighboring waters, into the waterway," he said. Police, fire and explosive ordnance crews from nearby Marine Corps Air Station Cherry Point arrived at the scene, and an incident command center was set up nearby. Jones confirmed that the material in the containers is PETN, allegedly one of the components of the bomb concealed by Umar Farouk AbdulMutallab, accused of trying to bomb Northwest Airlines Flight 253 in Amsterdam on December 25. PETN is a high explosive organic compound belonging to the same chemical family as nitroglycerin. Jones said PETN is a crystal packaged in water for stability. He said the people who transport "any highly flammable explosive devices" have to and did notify the port and local emergency and police officials. Coast Guard Lt. Cmdr. Chris O'Neil said the substance has industrial and medical uses. "Being an international port, we handle highly flammable explosive material all the time. Jet fuel comes through here all the time, gasoline, propane. So it's not unusual to have explosive material coming through Morehead City," he said. Also responding were the U.S. Customs and the Salvation Army.